Your step-by-step guide to the joined-up alphabet, with worksheets for every letter. 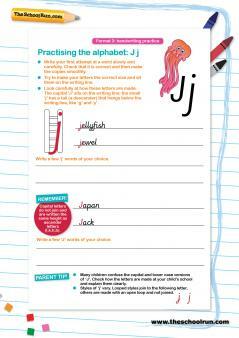 Whether your child is new to cursive writing or needs to improve their joined-up style these worksheets will take them through every join and shape to help boost their confidence and ability. An 'entry stroke' before each letter (see below for an 'n' with and without an entry stroke). If your school uses these strokes you could draw them in before giving your child the worksheets. The letters 'g', 'j' and 'y' can be made with a loop and joined to the following letter or with an open loop and not joined to the following letter. Some writing styles do not expect 'b', 'p' (and perhaps 's') to be joined to the following letter. Check how your child is expected to form 'f', 'v', 'w', 'x' and 'z' and adjust the worksheets accordingly. 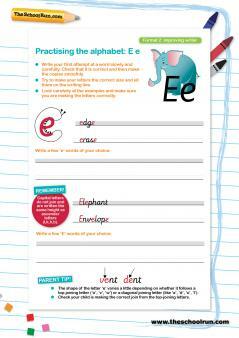 The letter worksheets are available in three formats, each with a different set of ruled lines to help children size and form their letters correctly. Format 1 (new writer) has a shaded area to show your child where to place the small letters ('a', 'e', 's', 'o', etc. and the lower parts of letters such as 'h', 'b', 'k'). 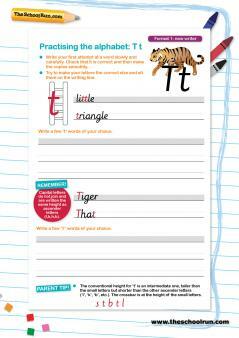 Print the worksheets in Format 1 if your child is is learning joined writing for the first time and still writes in a fairly large script. Format 2 (improving writer) offers a smaller writing area, but still has guide lines to help your child size letters correctly. Print the worksheets in Format 2 if your child has been working on their cursive style for a while and normally writes in a smaller size. Format 3 (handwriting practice) has single ruled base lines. When children understand the relative sizes of the letters and can manage to keep sizes consistent without the help of the shaded area and guide lines, they are ready to use the single-lined paper. Make this change as soon as your child is ready. There are no guidelines to mark the heights of the tall strokes (ascenders) or tails (descenders) on the worksheets; children are encouraged to judge their size by eye. This is because using extra guidelines like these can be counter-productive; once such guidelines are removed children often make their tall letters touch the writing line above, cluttering the horizontal space between the lines of writing and making the piece of work less easy to read. For more handwriting worksheets and lots of advice about improving your child's handwriting see our Handwriting Learning Journey.